Temperature of core compartment of the body (head and thorax) is normally around 37°C. Periphery is typically 2°C–4°C cooler than the core [Figure 1]. This gradient is maintained by tonic thermoregulatory vasoconstriction. Thermoregulation is the mechanism by which hypothalamus regulates body temperature at a stable level. Infants regulate their temperature remarkably well, but it is less robust in neonates and elderly. Thermoregulation is based on multiple signals coming from nearly every type of tissue. The processing of thermal information occurs in three phases: afferent input, central regulation, and efferent responses. [Figure 2] describes these three phases.,,,, Hypothalamus is the primary central structure regulating temperature. It integrates thermal input and activates effector mechanisms which normalize temperature by altering metabolic heat production and environmental heat loss. Each effector mechanism has its own threshold; there is orderly progression of responses in proportion to need, i.e., more energy efficient responses such as vasoconstriction are maximally utilized before metabolically costly responses such as shivering are activated. Efferent responses include behavioral and autonomic regulation. Behavioral regulation is the most powerful mechanism and requires conscious perception of body temperature; it is 50% mediated by skin temperature. Autonomic responses include various mechanisms. Sweating is the only mechanism by which body dissipates heat in hot surroundings; each gram of sweat evaporated dissipates 0.58 kcal of heat. Threshold temperature is the temperature at which a response is triggered. 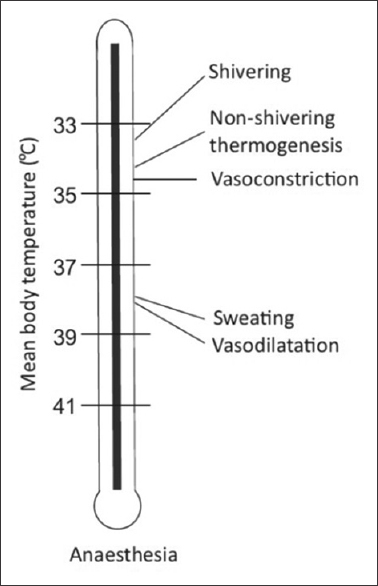 Thresholds for vasoconstriction and shivering are 36.5°C and 36.0°C, respectively. General anesthesia lowers this threshold by 2°C–3°C. The thresholds vary daily in both sexes (circadian rhythm) and monthly in women (up to 0.5°C). Exercise, food intake, infection, and hypothyroid and hyperthyroid states also alter threshold temperatures. Interthreshold range is the range over which autonomic responses are not activated. It is bound by sweating threshold at its upper end and vasoconstriction threshold at lower end [Figure 3]. Normally, it is only a few tenths of a degree centigrade (thermoregulatory zone) but increases under general anesthesia [Figure 4] and [Figure 5]. Gain is the extent to which the intensity of thermoregulatory responses increases with further deviation from the triggering threshold. Maximum intensity is when the intensity of the response no longer increases with further deviation in core temperature. Thermoneutral zone (TNZ) (range of temperature where healthy adults can maintain normal body temperature without using energy above normal basal metabolic rate) value is 25°C–30°C (77°F–86°F) for a naked man, standing upright, in still air. Light clothing, body composition, age, gender, and other losses due to radiation and convection alter TNZ. Hence, TNZ under controlled air conditioned environment is around 18°C–22°C. Under general anesthesia, behavioral regulation is not relevant since most patients are unconscious and frequently paralyzed. Patient relies on autonomic defenses and external thermal management for thermoregulation. Autonomic responses also are markedly impaired under anesthesia; most anesthetics increase warm response and reduce cold response thresholds. The interthreshold range increases up to 10-fold, from 0.3°C to about 2°C–4°C [Figure 3],[Figure 4],[Figure 5]. Temperatures within this range do not trigger thermoregulatory defense and patients are poikilothermic. 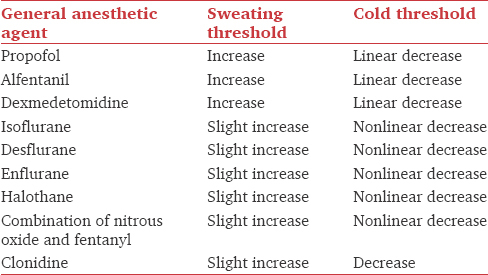 [Table 1] shows the effects of general anesthetic agents on sweating and cold thresholds.,,,, Midazolam slightly impairs thermoregulatory control. Painful stimulation can slightly increase vasoconstriction threshold; therefore, regional or local anesthesia decreases vasoconstriction threshold. Isoflurane and halothane impair thermoregulatory vasoconstriction in infants and children. Propofol and volatile anesthetics inhibit nonshivering thermogenesis. Infants are at further higher risk of hypothermia due to large surface area to body mass ratio. Hence, sweating is the best preserved thermoregulatory defense during general anesthesia. Its threshold is only slightly increased, and gain and maximum intensity remain normal. In contrast, vasoconstriction and shivering thresholds are markedly reduced, and efficacy of these responses is diminished even after being activated. Combination of core and mean skin temperature measurement is required to accurately estimate body heat content. Mercury-in-glass thermometers are slow, cumbersome, and no longer recommended. Electronic thermometers use thermistors and thermocouples. They are sufficiently accurate (±0.5°C), inexpensive, and most dependable modality. Infrared monitors detect heat given off by radiation and can measure temperature from tympanic membrane and forehead skin but are less reliable. Thermotropic liquid crystals incorporated in disposable sheets are also available but less accurate. 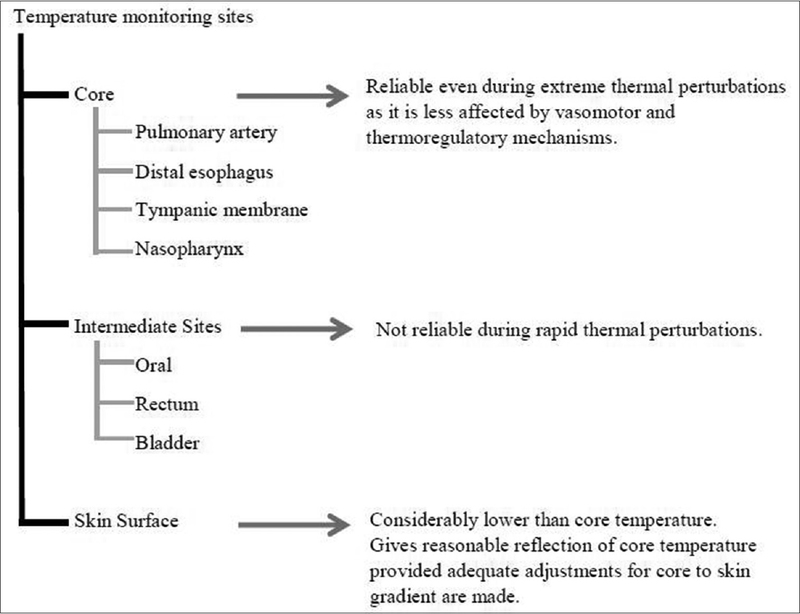 Temperature can be monitored at various sites as described in [Figure 6]. None of the existing guidelines specify the best device or best site to monitor temperature. The site and device selection depend on the physician, type of surgery, and accessibility of monitoring sites. The least invasive modality that gives a reliable assessment of core temperature should be preferred. National Institute for Clinical Excellence (NICE) guidelines recommend temperature measurement at 1 h before induction, every 30 min intraoperatively, every 15 min in the postanesthesia care unit, and every 4 h in the ward or every 30 min, if active warming is required in the ward. 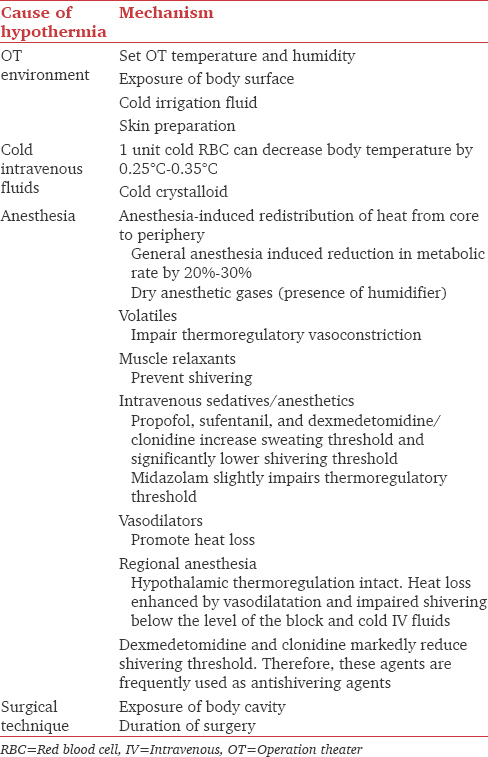 Hypothermia during general anesthesia occurs from a combination of anesthetic-induced impaired thermoregulation (cause vasodilation, inhibit vasoconstriction, and reduce metabolic rate by 20%–30%) and from exposure to cold environment [Table 2]. Heat transfer from the human body occurs in four ways: conduction, convection, radiation, and evaporation. 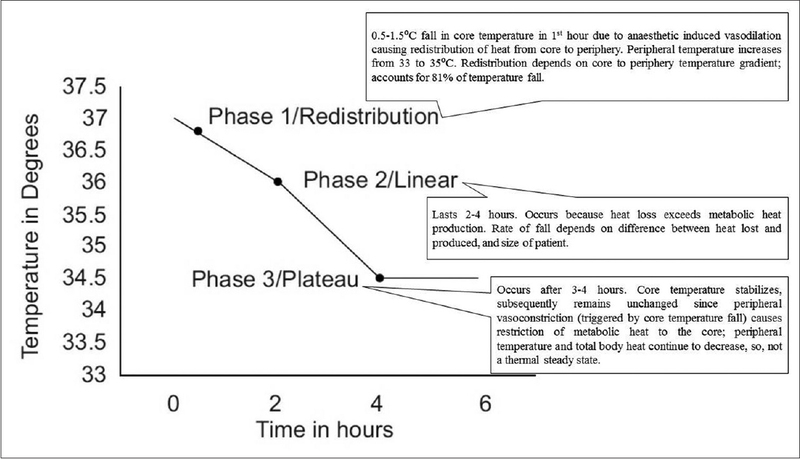 [Figure 7] describes the various mechanisms of heat loss under anesthesia.,, Radiation and convection contribute most to perioperative heat losses. Like general anesthesia, neuraxial anesthesia also impairs behavioral and autonomic thermoregulation. It blocks all thermal input from anesthetized regions and reduces vasoconstriction and shivering thresholds by 0.6°C above the level of block. Reduction in these thresholds is proportional to the number of spinal segments blocked. Supplementation with analgesics, sedatives, or general anesthesia further impairs thermoregulation. Hypothermia during neuraxial anesthesia is as severe as during general anesthesia. Core temperature decreases by 0.5°C–1.0°C. The decrease may not necessarily plateau since nerve block inhibits peripheral vasoconstriction. Hence, under regional anesthesia, patients often do not recognize being hypothermic; cold defenses are difficult to trigger and are less effective. Inadvertent intraoperative hypothermia (core temperature <36°C) is the most common perioperative thermal disturbance. Incidence varies from 6% to 90%, depending on the surgical population and demographic characteristics of patients. Risk is higher with prolonged surgery, extremes of age, extensive burns, lower preoperative temperature, severe trauma, and major intraoperative fluid shifts. Besides prolonging anesthetic drugs actions, hypothermia impairs coagulation and platelet function, increases blood loss and transfusion requirements, increases wound infections, prolongs hospital stay, causes postoperative discomfort, and increases heart rate, blood pressure, and plasma catecholamine levels. Mild hypothermia is associated with threefold increase in morbid myocardial outcomes. 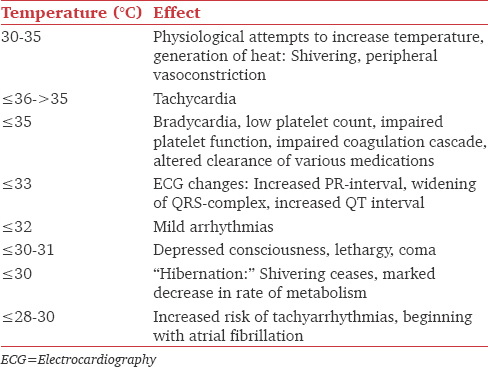 Harmful effects of hypothermia on various functions are shown in [Table 3]. Besides, extreme vasoconstriction due to hypothermia and volume depletion may obliterate pulse oximetry signals as well. Postanesthetic shivering occurs in up to 40% of patients. Incidence is higher in younger patients and those with low core temperature. Apparently benign, but several adverse effects such as increased oxygen consumption of up to 100%, raised intraocular and intracranial pressures, surgical incision stretch causing wound pain, and morbid myocardial outcomes are associated with it. Risk of postanesthetic shivering is reduced by maintaining strict normothermia. Treatment options include skin surface warming, pharmacological treatment with meperidine (25 mg/intravenous [IV]), clonidine (75 μg/IV), dexmedetomidine, ketanserin (10 mg/IV), magnesium sulfate (30 mg/kg IV), tramadol, physostigmine (0.04 mg/kg IV), and nefopam (0.15 mg/kg). The specific mechanism by which ketanserin, tramadol, magnesium sulfate, and physostigmine act is unknown. Meperidine reduces shivering threshold twice as much as vasoconstriction threshold. Dexmedetomidine is a newer agent which reduces vasoconstriction and shivering thresholds and is very effective in reducing shivering. ASA standards require every patient receiving anesthesia to have temperature monitoring when clinically significant changes in body temperature are intended, anticipated, or suspected. For office-based sedation, regional anesthesia, or general anesthesia, body temperature of pediatric patients shall be measured continuously. However, according to a European survey by the Thermoregulation in Europe Monitoring and Managing Patient Temperature Study group, temperature monitoring is done in 19.4% patients (24% in general anesthesia, 6% in regional anesthesia) and only 38.5% patients are actively warmed (43% during general anesthesia, 28% during regional anesthesia). Nasopharyngeal temperature under general anesthesia and tympanic temperature during regional anesthesia are most frequently measured and forced air warmers (FAWs) are used for warming. The Outcomes Research Consortium guidelines state as follows. Intraoperative core temperatures should usually be maintained >36°C unless hypothermia is specifically indicated. The NICE proposed Clinical Practice Guidelines for Management of Inadvertent Perioperative Hypothermia in Adults. They define hypothermia as core temperature less than 36.0°C. The perioperative pathway is divided into three phases: preoperative phase (1 h before induction of anesthesia), intraoperative phase (total anesthesia time), and postoperative phase (24 h after entry into recovery area in the theater suite). They recommend assessing patients for risk of developing perioperative hypothermia before transfer to the operation theater (OT). Anesthesia should be induced only after core temperature is more than 36°C. IV fluids and blood products must be warmed to 37°C using fluid warming device. Use of FAWs is recommended to prevent and treat perioperative hypothermia. The ACC/AHA 2007 Guidelines on Perioperative Cardiovascular Evaluation and Care for Noncardiac Surgery made Class I (Level of Evidence: B) recommendation to maintain body temperature in normothermic range for most procedures other than during periods, in which mild hypothermia is intended to provide organ protection. However, 2014 ACC/AHA Guidelines on Perioperative Cardiovascular Evaluation and Management of Patients Undergoing Noncardiac Surgery makes Class IIb recommendation (Level of Evidence: B) that maintenance of normothermia may be reasonable to reduce perioperative cardiac events in patients undergoing noncardiac surgery. Perioperative temperature fluctuations can be minimized by a variety of methods. Intraoperative warming, when patients are vasodilated due to anesthetic agents, is more effective, appropriate, and easier than treating hypothermia postoperatively (because of vasoconstriction due to weaning effect of anesthetics). The initial redistribution hypothermia is difficult to treat because flow of heat from core to periphery is massive and transfer of peripherally applied heat to the core requires an hour, even in vasodilated patients. Skin surface warming before induction of anesthesia does not significantly increase core temperature but increases peripheral tissue temperature and total body heat content, thus decreasing the temperature gradient. NICE guidelines recommend preoperative warming if temperature is <36°C and keeping patient comfortably warm at 36.5°C–37.5°C. Several studies have been carried out to evaluate the effectiveness of preoperative warming in preventing hypothermia. Skin surface warming for only 30 min before induction of anesthesia has been shown to prevent redistribution hypothermia. Most authors have warmed patients for an hour before induction using FAW. Effect of prewarming for 60 min before induction using an FAW device with temperature set at 38°C, in patients undergoing spinal surgery under general anesthesia, was studied. Lesser decrease in core temperature and lower incidence of intraoperative hypothermia was seen in the prewarmed group. The efficacy of prewarming children by increasing ambient temperature in the induction room and OT to 26°C for 30–40 min has been found to be safe and effective. With use of low flow rates and semi-closed circuits, heat loss by evaporation from respiratory system is minimal. Less than 10% of metabolic heat produced is lost through the respiratory tract. Hence, heating and humidification of anesthetic gases to maintain core temperature are not very effective. Administration of large quantity of cold fluids causes significant heat loss. One unit of refrigerated blood or one-liter crystalloid at room temperature can reduce mean body temperature by 0.25°C. At flow rate <35 ml/min, warming of fluids is not required in adults. Fluid warming is the only method that produces direct core warming and is recommended for all intraoperative infusions ≥500 ml in adults. Fluids cannot be heated to temperatures much higher than normal body temperature; most fluid warmers deliver fluid around body temperature. Red blood cells are stored at 4°C. Rapid transfusion (>100 ml/min) may cause sudden decrease in temperature with serious consequences. According to the WHO guidelines, keeping the patient warm is more important than warming blood; warming of blood is required in settings of large volume transfusions (adult: >50 ml/kg/h; children: >15 ml/kg/h), exchange transfusions in infants and in patients with clinically significant cold agglutinins. Several fluid warming devices are available. Delivery of warm fluids depends on the warming method used, flow rate, and length of tubing between warmer and patient. At low flow rates (<0.5 L/h), considerable heat loss occurs between the warmer and patient. At faster flow rates (>9 L/h), limited time and surface area for heat exchange are available, and resistance to flow through the warming apparatus is high. [Table 4] shows comparison of various fluid warming devices.,, Use of water baths or microwave technology for warming blood is not advocated. Resuscitation fluid warmers can warm large volumes of fluid rapidly and have air detector system which stops infusion if air is detected in circuit. The amount of heat lost through skin is roughly proportional to the exposed body surface area. 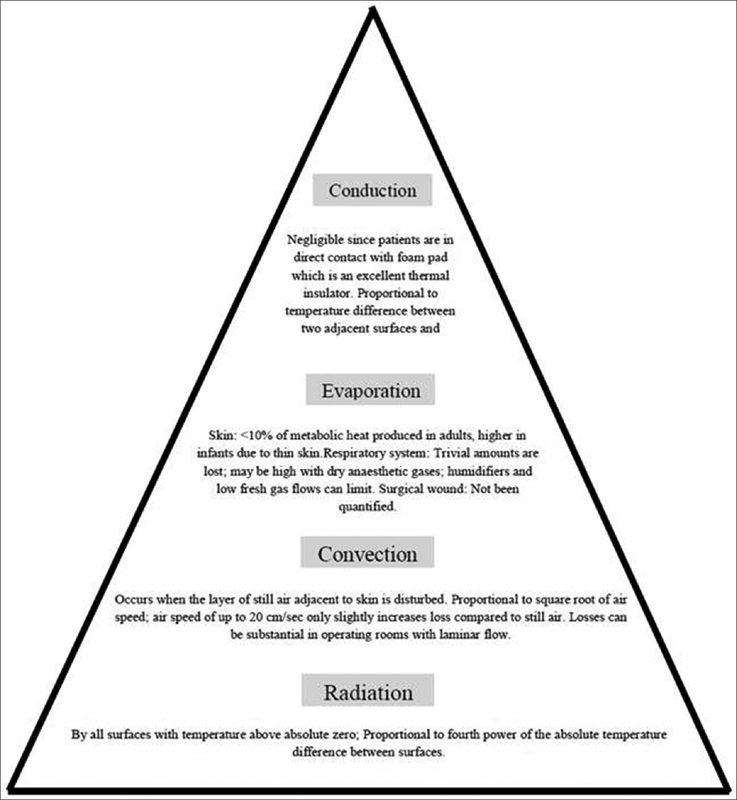 Operating room temperature is the most critical factor that determines cutaneous losses through radiation, convection, and evaporation. Increasing room temperature is one way of minimizing heat loss. Room temperature more than 23°C and 26°C is generally required to maintain normothermia in adults and infants, respectively, but is reported uncomfortable by most OT personnel. Some authors recommend ambient temperatures of 21°C, 27°C, and 29°C for adults, full-term newborns, and premature newborns, respectively. Revised National Accreditation Board for Hospitals and Health Care Providers guidelines for air conditioning in OTs require temperature and relative humidity in OTs to be 21°C ± 3°C and 40%–60%, respectively, with a relative humidity of 55%. Appropriate display of these conditions and minimum of 25 air changes/h with a minimum of 4 air changes having fresh air component is required. Airflow must be unidirectional and downward on the OT table. 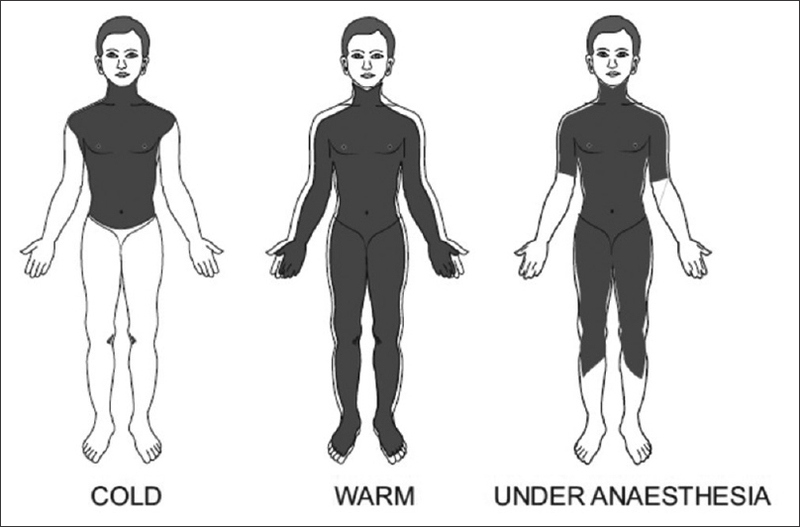 In the operation room, passive insulation or active warming can achieve cutaneous warming. Passive insulation is the easiest method of cutaneous warming but is insufficient alone. Cotton blankets, surgical drapes, plastic sheets, reflective composites (“space blankets”), and sleeping bags are used. Insulation is provided by the layer of still air trapped beneath the device. A single layer reduces heat loss by approximately 30%; addition of extra layers further reduces heat loss only minimally. Active warming devices include circulating-water mattresses/garments, FAWs, resistive heating devices, negative pressure water warming systems, and radiant heaters. Underbody warming devices/mattresses are used for surgeries where blankets cannot be used. However, contrary to belief, these are not superior to over the body warming devices due to reduced perfusion of dependent areas. Warming mattresses have been shown to maintain temperature during prebypass period in cardiac surgeries. Besides the technology used to maintain normothermia, intraoperative warming also depends on age of patient, type of surgery, disease state, and anesthetics. 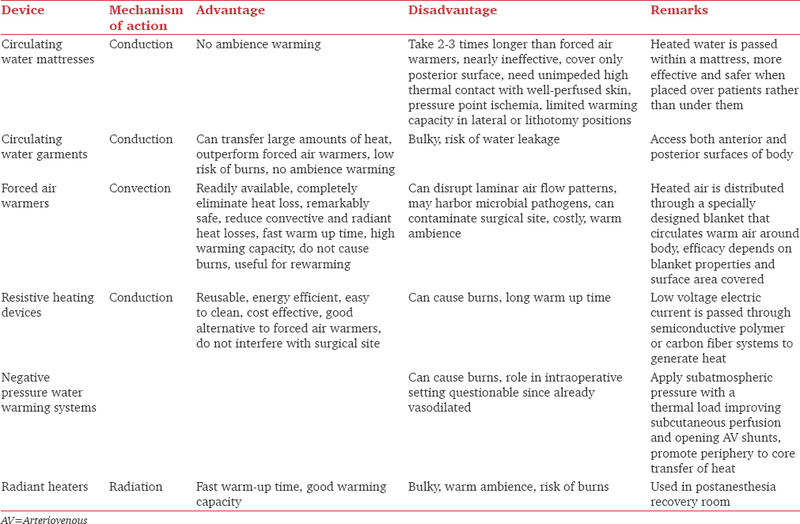 [Table 5] gives a description of various active warming devices.,,,,,, FAWs are the most commonly tested, recommended, and used devices for intraoperative warming. Forced air blankets and radiant heaters are most commonly used to warm patients in postanesthesia recovery room. Due to continued peripheral vasoconstriction, they have low efficiency and take long time to warm patient. Intraoperative warming is therefore ideal. Active warming is better compared to passive warming alone in the postoperative phase also. Active warming helps regain temperature an hour faster. Evidence suggests that active warming with convection is slightly superior to conductive and radiant warming in the postoperative period too. Hyperthermia is more dangerous than a similar degree of hypothermia. It causes discomfort and increases metabolic demand and cardiovascular stress. “Hyperthermia” indicates core temperature exceeding normal values; “fever” indicates regulated increase in core temperature targeted by the thermoregulatory system. Passive hyperthermia results from excessive patient heating without adequate core temperature monitoring. It commonly occurs in infants and children because sweating under anesthesia is less effective in them. Exact incidence is not known. It is treated by discontinuing active warming and removing excessive insulation. Fever develops when endogenous pyrogens increase the “set point” of thermoregulatory system. Fever is relatively rare under general anesthesia since volatile anesthetics and opioids inhibit expression of fever. Perioperative fever can be due to infection, mismatched blood transfusions, blood in fourth ventricle, allergic reactions. Some degree of fever typically occurs after surgery also. Fever is treated by removing the underlying cause, antipyretics, and finally by cautious active cooling. Intraoperative temperature is still one of the least commonly monitored vital parameters. Fluctuations in temperature occur commonly intraoperatively, and careful monitoring, prevention, and treatment must be imbibed into the wholesome anesthetic plan of patients. A combined approach targeting perioperative warming using a combination of fluid and cutaneous warming strategies should be advocated. The site and device of temperature monitoring may be left to the anesthesiologists' discretion depending on the site of surgery and accessibility. Poulos DA. Central processing of cutaneous temperature information. Fed Proc 1981;40:2825-9. Jessen C, Feistkorn G. Some characteristics of core temperature signals in the conscious goat. Am J Physiol 1984;247 (3 Pt 2):R456-64. Jessen K. An assessment of human regulatory nonshivering thermogenesis. Acta Anaesthesiol Scand 1980;24:138-43. Kellogg DL Jr.In vivo mechanisms of cutaneous vasodilation and vasoconstriction in humans during thermoregulatory challenges. J Appl Physiol 2006;100:1709-18. Boudet J, Qing W, Boyer-Chammard A, Del Franco G, Bergougnan JL, Rosen P, et al. Dose-response effects of atropine in human volunteers. Fundam Clin Pharmacol 1991;5:635-40. Lopez M, Sessler DI, Walter K, Emerick T, Ozaki M. Rate and gender dependence of the sweating, vasoconstriction, and shivering thresholds in humans 1994;80:780-8. Mekjavic IB, Eiken O. 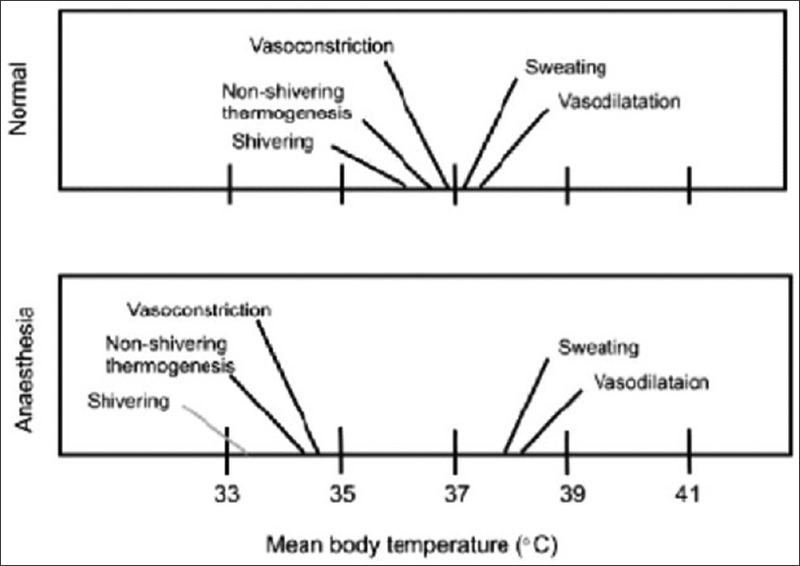 Contribution of thermal and nonthermal factors to the regulation of body temperature in humans. J Appl Physiol 2006;100:2065-72. Sessler DI. Temperature regulation and monitoring. In: Miller RD, editor. Miller's Anesthesia. 7th ed., Ch. 48. Philadelphia: Churchill Livingstone Elsevier; 2009. Matsukawa T, Kurz A, Sessler DI, Bjorksten AR, Merrifield B, Cheng C. Propofol linearly reduces the vasoconstriction and shivering thresholds. Anesthesiology 1995;82:1169-80. Talke P, Tayefeh F, Sessler DI, Jeffrey R, Noursalehi M, Richardson C. Dexmedetomidine does not alter the sweating threshold, but comparably and linearly decreases the vasoconstriction and shivering thresholds. Anesthesiology 1997;87:835-41. Xiong J, Kurz A, Sessler DI, Plattner O, Christensen R, Dechert M, et al. Isoflurane produces marked and nonlinear decreases in the vasoconstriction and shivering thresholds. Anesthesiology 1996;85:240-5. Annadata R, Sessler DI, Tayefeh F, Kurz A, Dechert M. Desflurane slightly increases the sweating threshold but produces marked, nonlinear decreases in the vasoconstriction and shivering thresholds. Anesthesiology 1995;83:1205-11. Delaunay L, Bonnet F, Liu N, Beydon L, Catoire P, Sessler DI. 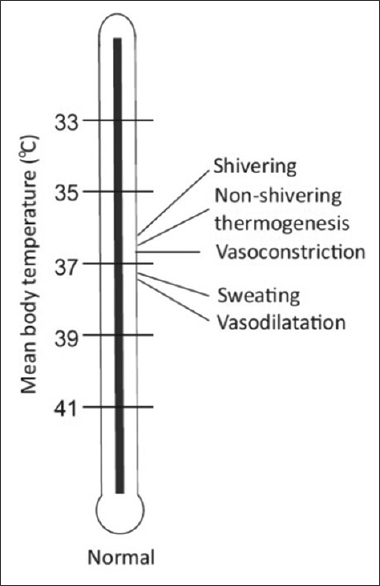 Clonidine comparably decreases the thermoregulatory thresholds for vasoconstriction and shivering in humans. Anesthesiology 1993;79:470-4. Kurz A, Sessler DI, Annadata R, Dechert M, Christensen R, Bjorksten AR. Midazolam minimally impairs thermoregulatory control. Anesth Analg 1995;81:393-8. Washington DE, Sessler DI, McGuire J, Hynson J, Schroeder M, Moayeri A. Painful stimulation minimally increases the thermoregulatory threshold for vasoconstriction during enflurane anesthesia in humans. Anesthesiology 1992;77:286-90. Bissonnette B, Sessler DI. The thermoregulatory threshold in infants and children anesthetized with isoflurane and caudal bupivacaine. Anesthesiology 1990;73:1114-8. Bissonnette B, Sessler DI. Thermoregulatory thresholds for vasoconstriction in pediatric patients anesthetized with halothane or halothane and caudal bupivacaine. Anesthesiology 1992;76:387-92. Plattner O, Semsroth M, Sessler DI, Papousek A, Klasen C, Wagner O. Lack of nonshivering thermogenesis in infants anesthetized with fentanyl and propofol. Anesthesiology 1997;86:772-7. Lenhardt R, Sessler DI. Estimation of mean body temperature from mean skin and core temperature. Anesthesiology 2006;105:1117-21. Imamura M, Matsukawa T, Ozaki M, Sessler DI, Nishiyama T, Kumazawa T. The accuracy and precision of four infrared aural canal thermometers during cardiac surgery. Acta Anaesthesiol Scand 1998;42:1222-6. Cork RC, Vaughan RW, Humphrey LS. Precision and accuracy of intraoperative temperature monitoring. Anesth Analg 1983;62:211-4. Robinson BJ, Ebert TJ, O'Brien TJ, Colinco MD, Muzi M. Mechanisms whereby propofol mediates peripheral vasodilation in humans. Sympathoinhibition or direct vascular relaxation? Anesthesiology 1997;86:64-72. Stevens WC, Cromwell TH, Halsey MJ, Eger EI 2nd, Shakespeare TF, Bahlman SH. The cardiovascular effects of a new inhalation anesthetic, Forane, in human volunteers at constant arterial carbon dioxide tension. Anesthesiology 1971;35:8-16. Hardy JD, Milhorat AT, DuBois EF. Basal metabolism and heat loss of young women at temperatures from 22 degrees C to 35 degrees C. J Nutr 1941;21:383-403. Maurer A, Micheli JL, Schütz Y, Freymond D, Jéquier E. Transepidermal water loss and resting energy expenditure in preterm infants. Helv Paediatr Acta 1984;39:405-18. Roe CF. Effect of bowel exposure on body temperature during surgical operations. Am J Surg 1971;122:13-5. Matsukawa T, Sessler DI, Sessler AM, Schroeder M, Ozaki M, Kurz A, et al. Heat flow and distribution during induction of general anesthesia. Anesthesiology 1995;82:662-73. Kurz A, Sessler DI, Christensen R, Dechert M. Heat balance and distribution during the core-temperature plateau in anesthetized humans. Anesthesiology 1995;83:491-9. Ozaki M, Kurz A, Sessler DI, Lenhardt R, Schroeder M, Moayeri A, et al. Thermoregulatory thresholds during epidural and spinal anesthesia. Anesthesiology 1994;81:282-8. Leslie K, Sessler DI. Reduction in the shivering threshold is proportional to spinal block height. Anesthesiology 1996;84:1327-31. Valley MA, Bourke DL, Hamill MP, Raja SN. Time course of sympathetic blockade during epidural anesthesia: Laser Doppler flowmetry studies of regional skin perfusion. Anesth Analg 1993;76:289-94. Harper CM, Andrzejowski JC, Alexander R. NICE and warm. Br J Anaesth 2008;101:293-5. Monzon CG, Arana CA, Valz HA, Rodriguez FA, Mejia JJ, Gomez JA. Temperature management during the perioperative period and frequency of inadvertent hypothermia in a general hospital. Rev Colomb Anestesiol 2013;41:97-103. Michelson AD, MacGregor H, Barnard MR, Kestin AS, Rohrer MJ, Valeri CR. Reversible inhibition of human platelet activation by hypothermia in vivo and in vitro. Thromb Haemost 1994;71:633-40. Rajagopalan S, Mascha E, Na J, Sessler DI. The effects of mild perioperative hypothermia on blood loss and transfusion requirement. Anesthesiology 2008;108:71-7.
van Oss CJ, Absolom DR, Moore LL, Park BH, Humbert JR. Effect of temperature on the chemotaxis, phagocytic engulfment, digestion and O2 consumption of human polymorphonuclear leukocytes. J Reticuloendothel Soc 1980;27:561-5. Frank SM, Higgins MS, Breslow MJ, Fleisher LA, Gorman RB, Sitzmann JV, et al. The catecholamine, cortisol, and hemodynamic responses to mild perioperative hypothermia. A randomized clinical trial. Anesthesiology 1995;82:83-93. Polderman KH. Application of therapeutic hypothermia in the intensive care unit. Opportunities and pitfalls of a promising treatment modality – Part 2: Practical aspects and side effects. Intensive Care Med 2004;30:757-69. Eberhart LH, Döderlein F, Eisenhardt G, Kranke P, Sessler DI, Torossian A, et al. Independent risk factors for postoperative shivering. Anesth Analg 2005;101:1849-57. Doufas AG, Lin CM, Suleman MI, Liem EB, Lenhardt R, Morioka N, et al. Dexmedetomidine and meperidine additively reduce the shivering threshold in humans. Stroke 2003;34:1218-23. Joris J, Banache M, Bonnet F, Sessler DI, Lamy M. Clonidine and ketanserin both are effective treatment for postanesthetic shivering. Anesthesiology 1993;79:532-9. Kizilirmak S, Karakas SE, Akça O, Ozkan T, Yavru A, Pembeci K, et al. Magnesium sulfate stops postanesthetic shivering. Ann N Y Acad Sci 1997;813:799-806. De Witte J, Rietman GW, Vandenbroucke G, Deloof T. Post-operative effects of tramadol administered at wound closure. Eur J Anaesthesiol 1998;15:190-5. Torossian A; TEMMP (Thermoregulation in Europe Monitoring and Managing Patient Temperature) Study Group. Survey on intraoperative temperature management in Europe. Eur J Anaesthesiol 2007;24:668-75. Fleisher LA, Fleischmann KE, Auerbach AD, Barnason SA, Beckman JA, Bozkurt B, et al. 2014 ACC/AHA guideline on perioperative cardiovascular evaluation and management of patients undergoing noncardiac surgery: A report of the American College of Cardiology/American Heart Association Task Force on practice guidelines. Circulation 2014;130:e278-333. Just B, Trévien V, Delva E, Lienhart A. Prevention of intraoperative hypothermia by preoperative skin-surface warming. Anesthesiology 1993;79:214-8. Sessler DI, Schroeder M, Merrifield B, Matsukawa T, Cheng C. Optimal duration and temperature of prewarming. Anesthesiology 1995;82:674-81. Andrzejowski J, Hoyle J, Eapen G, Turnbull D. Effect of prewarming on post-induction core temperature and the incidence of inadvertent perioperative hypothermia in patients undergoing general anaesthesia. Br J Anaesth 2008;101:627-31. Cassey JG, King RA, Armstrong P. Is there thermal benefit from preoperative warming in children? Paediatr Anaesth 2010;20:63-71. Hynson JM, Sessler DI. Intraoperative warming therapies: A comparison of three devices. J Clin Anesth 1992;4:194-9. Sessler DI. Mild perioperative hypothermia. N Engl J Med 1997;336:1730-7. John M, Ford J, Harper M. Peri-operative warming devices: Performance and clinical application. Anaesthesia 2014;69:623-38. Faries G, Johnston C, Pruitt KM, Plouff RT. Temperature relationship to distance and flow rate of warmed i.v. fluids. Ann Emerg Med 1991;20:1198-200. Uhl L, Pacini D, Kruskall MS. A comparative study of blood warmer performance. Anesthesiology 1992;77:1022-8. Harris AM, Atterbury CL, Chaffe B, Elliott C, Hawkins T, Hennem SJ, et al. Guideline on the Administration of Blood Components. British Committee for Standards in Hematology; 2009. Available from http://www.bcshguidelines.com/documents/Admin_blood_components_bcsh_05012010.pdf. [Last accessed on 03-06-2017]. Sessler DI, Moayeri A, Støen R, Glosten B, Hynson J, McGuire J. Thermoregulatory vasoconstriction decreases cutaneous heat loss. Anesthesiology 1990;73:656-60. Luginbuehl I, Bissonnette B, Davis PJ. 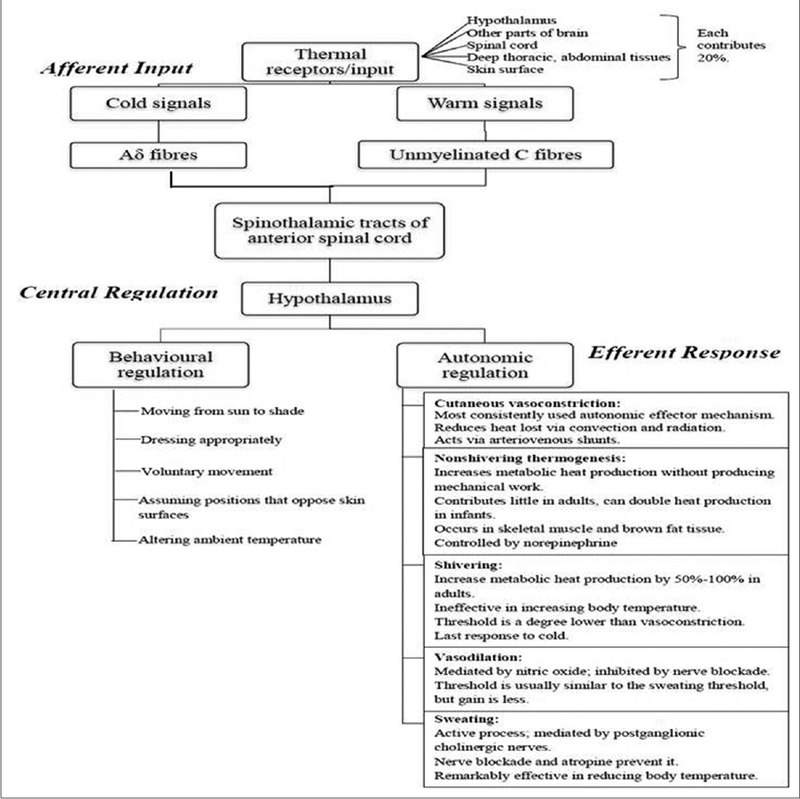 Thermoregulation: Physiology and perioperative disturbances. In: Motoyama EK, Davis PJ, editors. Smith's Anesthesia for Infants and Children. 7th ed. Philadelphia: Mosby Elsevier; 2006. p. 154-76. NABH Revised Guidelines for Air Conditioning in Operation Theatres. Issue No. 2. Issue Date. 06/14. Available from http://www.nabh.co/images/pdf/RevisedGuidelines_AirConditioning_OT.docx [Last accessed on 03-06-2017]. Rao S, Rajan M. Heat production and loss. Update Anaesth 2008;24:182-7. Engelen S, Himpe D, Borms S, Berghmans J, Van Cauwelaert P, Dalton JE, et al. An evaluation of underbody forced-air and resistive heating during hypothermic, on-pump cardiac surgery. Anaesthesia 2011;66:104-10. Morris RH, Kumar A. The effect of warming blankets on maintenance of body temperature of the anesthetized, paralyzed adult patient. Anesthesiology 1972;36:408-11. Taguchi A, Ratnaraj J, Kabon B, Sharma N, Lenhardt R, Sessler DI, et al. Effects of a circulating-water garment and forced-air warming on body heat content and core temperature. Anesthesiology 2004;100:1058-64. Bräuer A, Quintel M. Forced-air warming: Technology, physical background and practical aspects. Curr Opin Anaesthesiol 2009;22:769-74. Giesbrecht GG, Ducharme MB, McGuire JP. Comparison of forced-air patient warming systems for perioperative use. Anesthesiology 1994;80:671-9. Bräuer A, Bovenschulte H, Perl T, Zink W, English MJ, Quintel M. What determines the efficacy of forced-air warming systems? A manikin evaluation with upper body blankets. Anesth Analg 2009;108:192-8. Dasari KB, Albrecht M, Harper M. Effect of forced-air warming on the performance of operating theatre laminar flow ventilation. Anaesthesia 2012;67:244-9. Warttig S, Alderson P, Campbell G, Smith AF. Interventions for treating inadvertent postoperative hypothermia. Cochrane Database Syst Rev 2014;Issue 11. Art. No.:CD009892. Negishi C, Lenhardt R, Sessler DI, De Witte J, Ikeda T, Kurz A, et al. Desflurane reduces the febrile response to administration of interleukin-2. Anesthesiology 1998;88:1162-9. Negishi C, Kim JS, Lenhardt R, Sessler DI, Ozaki M, Vuong K, et al. Alfentanil reduces the febrile response to interleukin-2 in humans. Crit Care Med 2000;28:1295-300. Frank SM, Kluger MJ, Kunkel SL. Elevated thermostatic setpoint in postoperative patients. Anesthesiology 2000;93:1426-31.